Louis Courthion was the son of the merchant Étienne Joseph Courthion. He left for France when he was seventeen. He was autodidact and non-clerical and worked for several newspapers. Apart from France he worked in Belgium and Geneva. He was an important historian for his native region Valais and in 1903 he published "Les Peuples de Valais"
In 1898 he married Lisa Louise Joséphine Bocquet. Their son Pierre was a painter, a poet and a critic. He worked in Paris for many years and made a series of interviews with Henri Matisse. 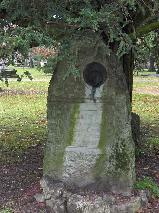 The grave of Louis Courthion at the Cimetière de Plainpalais, Genève.